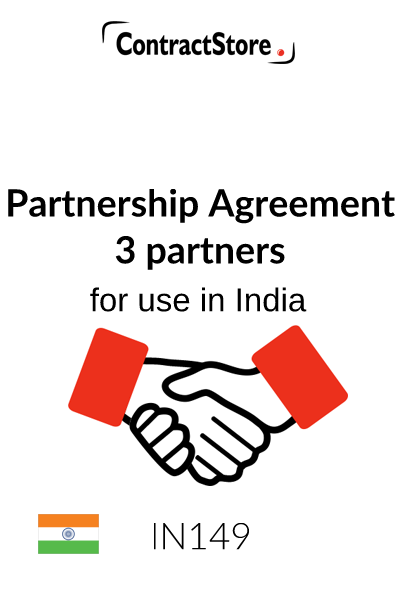 Designed for use by businesses in India, this partnership agreement template is suitable either for the establishment of a new three-person partnership or for formalising an existing partnership. It is drafted in accordance with Indian law. The agreement deals with partnership capital, profits and losses, drawings by partners, conduct of partnership business and decision-making including provisions relating to deadlock. You need this contract if you want to establish a three-person partnership, or formalize an existing partnership, and want to set out your relationship to the other parties, your mutual obligations, and the rules governing the conduct of your partnership. 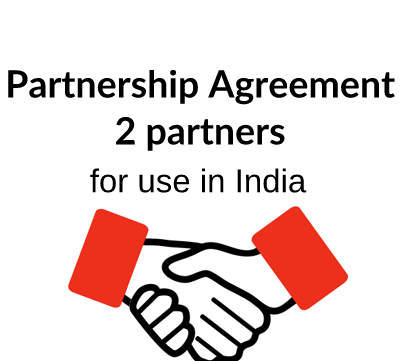 Under the Indian Partnership Act 1832 (“PA”) partnership is defined as follows: ‘“Partnership” is the relation between persons who have agreed to share the profits of a business carried on by all or any of them acting for all.’. There must be a partnership agreement or partnership deed executed by the partners prior to formation of the partnership. The PA governs the relationship unless there is a partnership deed. The partnership deed needs to be registered with the Registrar of Firms of the state in which the principal office of the partnership is situated. The date to be inserted on page one is the date on which all the partners have signed and executed the Agreement. The full names and permanent address of all partners should be inserted on Page one. Our template refers to a) as it is the more usual form of partnership in India. Partnerships are registered in a selected state and appropriate stamp duty has to be paid in the state where the Partnership is to be registered. It is usual for partnerships to arrange that each partner can withdraw a regular monthly amount on account of his share of profits, for their personnel expenses, which at the end of the year shall be offset with their capital account. This clause deals with this matter, and makes it clear that if there is not enough money in the account, drawings cannot be taken. Similarly, any partner who withdraws more than his profit share for a year must immediately repay the surplus. This clause contains a reference to the possibility of one or all partners making a loan to the partnership and in that case, interest at the agreed rate set out in Clause 1 will be payable. Clause 7.2 provides that a loan must be repaid on notice – six months is suggested in our clause. In addition to considerations of practicality, under the law, individual partners have joint and several liability, i.e. a debt incurred on behalf of the partnership by one partner can result in either of the partners becoming liable to the creditor for that debt. Unanimous agreement therefore gives protection to all partners. If any of the partners is only involved on a part-time basis, or if a partner has an interest in another business, then appropriate wording should be inserted to make it clear that the particular circumstances are acceptable to the partnership. This clause provides not only for proper accounts to be maintained but also for a balance sheet and profit and loss account to be prepared each year. The firm’s external accountants will prepare the annual accounts which will be signed off by the partners. Adequate provision for reserves, etc, will normally be agreed on the recommendation of the accountants and this topic is covered by clause 12.2. Remuneration given to the partners need to be inserted here. This clause is very important from the Income Tax point of view in India since there is a deduction for remuneration of the partners from the taxable income which decreases the tax liability. The remuneration of the partner cannot exceed the limit given in this clause. Therefore due precaution should be taken before fixing the remuneration, taking into account the sale forecast etc. Remuneration is different from drawings as the drawings are on capital account and the remuneration is a revenue expense. This Clause sets out the key duties of the partners to ensure the effective running of the partnership. The term ‘hundies’ in 14.3 refers to financial instruments that evolved on the Indian sub-continent and are used in trade and credit transactions. In India business organisations often need to interact with the public sector and hence the references in Clauses 14.4-14.8 inclusive. Clause 14.9 selects arbitration as the resolution method in the case of disputes. This provision deals with the termination of the partnership as a result of retirement or death. It provides for the continuation of the partnership through succession which is common in India. This clause sets out the process to be followed in the case of a dispute and refers to Arbitration as the chosen method. Clause 17.2 confirms the application of PA.
A “Boilerplate” or back up clause which deals with the possibility of one of the terms becoming invalid for some reason. For information on Boilerplate Clauses see the Contract Store Free Document Z159. 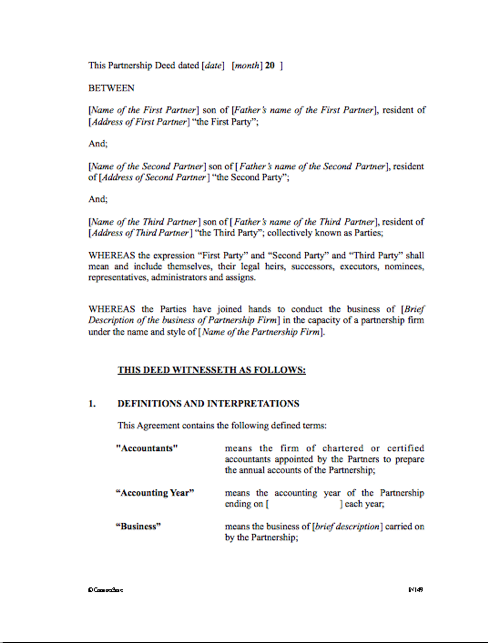 Each partner should sign the Agreement in the presence of an independent witness. Assuming each partner wants a signed copy, two copies of the Agreement in its final form should be prepared and signed by all partners and witnessed.